There are so many stories behind every memorial. Of course, there are exceptions, but outside graveyards most memorials tend toward the grand. However, if you happen to be wandering about the southern slopes of Portsdown Hill, just north of Fareham in Hampshire, you might stumble across a modest tribute to a Battle of Britain pilot, James Tillet (or Tillett), one of ‘the Few’, who crashed and died nearby. It is hard to conceive now that a great air battle once took place in the skies over southern England. Flying Officer Tillet belonged to 238 Squadron, equipped with Hawker Hurricane fighter aircraft, based at RAF Middle Wallop near Andover. The squadron had actually been decamped to a satellite station, RAF Chilbolton, and was scrambled from there on 6th November 1940 to intercept a German bomber force heading toward Portsmouth. Tillet’s aircraft was probably one of two shot down that day by Major Helmut Wick in a Messerschmitt Bf109. Eyewitnesses say that the Hurricane belly-landed in a field near Whitedell Farm and that Tillet, slumped over the controls, could not be pulled from the aircraft before it caught fire. He was just 22 years old and is buried in Ann’s Hill Cemetery in nearby Gosport. Tillet was a regular RAF officer, having passed out from Cranwell, the RAF equivalent of Sandhurst, before the war. Before that, he had attended St Lawrence’s College in Ramsgate, Kent. We know he enjoyed running and hockey and that he was the adopted son of Maud Reynolds of Courteenhall – a village and estate in Northamptonshire to where, coincidentally, his old school was evacuated in 1940. A short time after Tillet’s death, on 28th November, Major Wick was himself shot down and killed over the Isle of Wight. 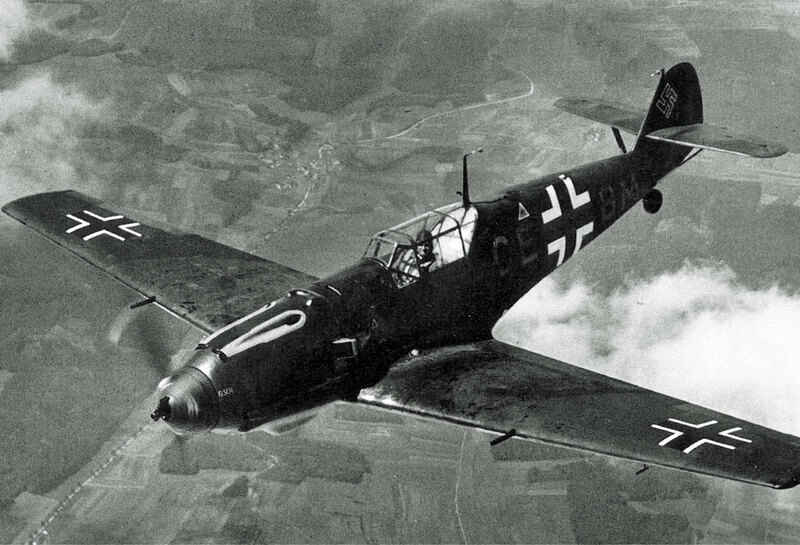 He too was young – 25 – though an air-ace credited with 56 ‘kills’ and a holder of the Iron Cross. He had two children, one of whom he never met. RAF Chilbolton, Tillet’s last home, went on to become a larger base hosting USAAF fighter and transport squadrons. It has largely returned to agricultural use now, but since 1992 part of the old base has been used by Chilbolton Flying Club. There are so many stories behind the bald facts recounted above. The larger backdrop of the Battle of Britain, of course, is part of our history; though the events of that particular day, 6th November, in 1940 don’t figure greatly in any book. I’m touched by the thought of James Tillet – how did he come to be there? Was he the product of a romance from the previous war? Did he have unknown brothers and sisters? A sweetheart? What was he like? Who was Maud Reynolds? What was her story? The Corteenhall Estate has been owned by the Wake family since 1673; did Maud work there? And is the fact that James Tillet’s old school was evacuated to Corteenhall merely a coincidence? Major Helmut Paul Emil Wick’s life is a little more public – he was a decorated war hero. The details of the lives of the participants in most dramas are long-forgotten; does anyone think of Tillet, Wick and Maud Reynolds at all now? Are there any descendents? 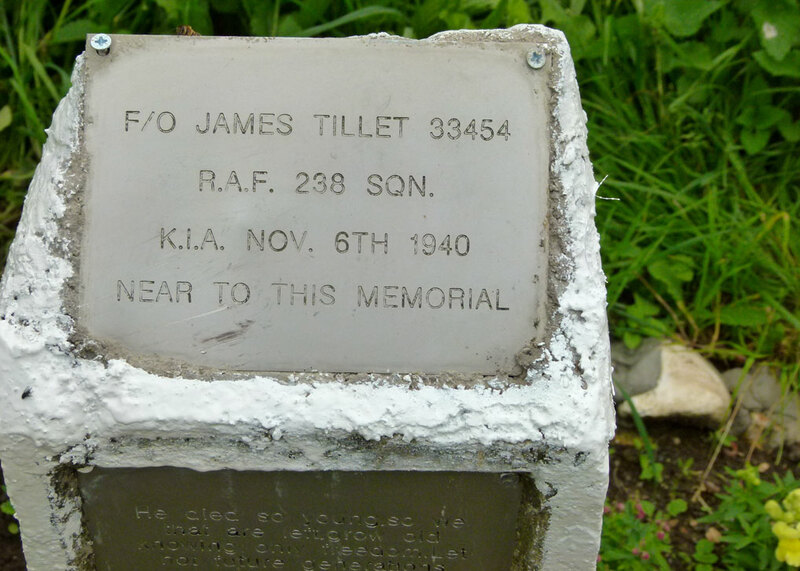 Though F/O Tillet is also commemorated on the Battle of Britain Memorial in London and Major Wick’s name may well appear on a memorial in Germany, we have only heard of them because someone took the trouble to erect a nondescript concrete memorial on a country lane. “He died so young, so we that are left, grow old knowing only freedom. Let not future generations squander such a gift. Graham Alderson 1994”. I understand that Graham Alderson put up several memorials to airmen in the Portsmouth area, at his own expense, sometime in the 1990s. Apart from working out he was probably born in the mid-1920s, I couldn’t find any information about him; but he is/was obviously a good egg. So there’s yet another story. And the memorial is tended by a local man – see the comments, below. I’d like to thank my brother for showing me James Tillet’s memorial. 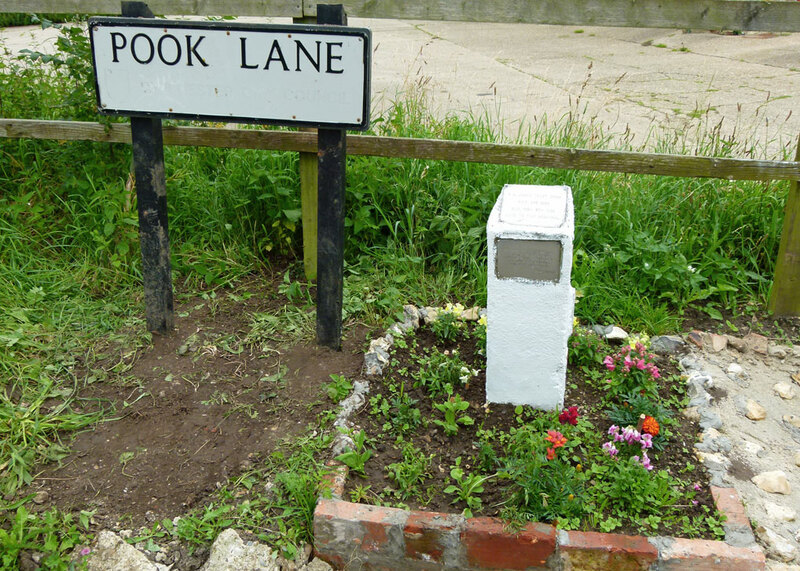 If you’re round that way, you’ll find it at the junction of Pook Lane and Spurlings Road, by the Wallington River just north of the M27. Hi – I’m sorry for not replying to you before. I would have thought your best bet would be to try to get a look at the Squadron records for the day – pilots’ log books may also be available. Good luck – and thanks for dropping in! Hi Mike, a bit late but just found your post, I just wanted to share that my dad who’s 77 has been maintaining James Tillet’s memorial for over 20 years always planting fresh flowers and keeping it tidy, just want people to know people do still care and it was nice to see that people do visit the site. That’s wonderful, Tina; your dad is part of the story – thanks for letting us know – really appreciate it. I must try to visit James Tillet’s grave next time I’m in that neck of the woods. Welcome – and thanks for dropping by. Very touching story. And I too would like to know the rest of the story. Unsung heroes are all around us. By the way I’m reading a book that you’d like. “In the Land of the Giants – A Journey Through the Dark Ages” by Max Adams. I just finished the part where he walked from London to Sutton Hoo. The flyleaf states: “A cultural exploration of the Dark Age landscapes of Britain that poses a significant question: is the modern world simply the realization of our ancient past?” Published in 2016. Hope you can find it. Thanks, Marcia – I’ll look that one up! Always good to remember the stories of those who gave their lives for our country. So few are left from that ‘The Greatest Generation’. We should get as many stories as we can. Such a thoughtful post, Mike. Thank-you. My mother and my late father both watched the Battle of Britain unfold in the skies above them and even though they were both very young at the time (both born 1930) they were amazed at the bravery and courage shown by these young airmen. I am pleased that there are memorials to a few of the airmen. In seeing these tributes we are reminded of all the other young people who lost their lives fighting for their country. Enjoyed that little story. Makes me think of our son and whether anyone in the little town near to which he died will think of him 100 years from now. Maybe I should think of copying Graham Alderson. I think that’s a lovely idea, Stew. Those memorials are a wonderful tribute to the young men who fought for what we have today. How sad a story of these two brave young men, and the hundreds like them I guess, doing their part to protect our freedoms. Thank you for sharing their stories. i’m reading the third of William Manchester’s trilogy about Winston Churchill and am in the middle of reading about the Battle for Britain. What an incredible job those young men did against just impossible odds. A poignant thing to do. Men like James saved the world. Such a wonderful way to remember, and it also offers the valuable past to those unaware. Pool Lane — I’m sure there is a story there, too. Memorials are erected, “lest we forget”, but they can’t hold the full story of a life and we are left with many questions. Thankful to men like Mr Alderson who do try. We should never forget those brave young men who died. And I mean young… Tillet was 22 and Wick was 25. I can’t imagine my 2 sons fighting a war and flying Hawker Hurricanes and Messerschmitts at that age. Thank goodness. Alderson – thanks for spotting that! I am touched that Graham Alderson put up these memorials. What a good thing to do.